10x / 20x eyepiece and 2x objective lens, the magnifications is 20x and 40x. 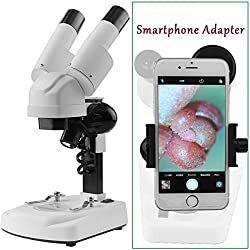 Contain a smartphone adapter (can connect to the 10x eyepiece only) by witch you can capture Beauty in the MicroWord. 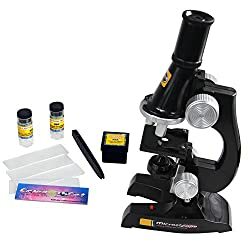 High-quality stereo microscope does the job of two instruments, allowing you to view both slides and 3D objects – like the included geode specimen. Double function Light System Direct light and Transmitted light. The illuminator is powered by three AA batteries (not included), which makes the microscope independent of any external electrical sources. 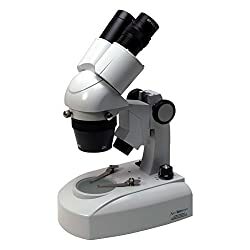 WIDE RANGE OF MAGNIFICATION- Objectives 4x, 10x, and 40x with eyepieces 10x, 25x giving a magnification range of from 40x to 1000x. You can match arbitrarily with any magnification you want and observe different configuration of the cells. DUAL ILLUMINATION- Adopted NA0.65 concentrator to provide a better lighting conditions for your kids. 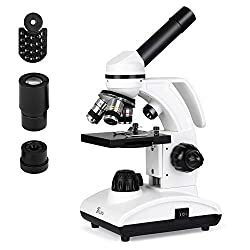 Built-in adjustable light source on the base and superior LED illumination on the top to observe objects of different textures with optical microscope. PORTABLE AND EASY OPERATION- With 45 degree inclined 360 degree rotating monocular head, which are ergonomic and fit for kids different positions to observe. Make any angle possible to view conveniently. 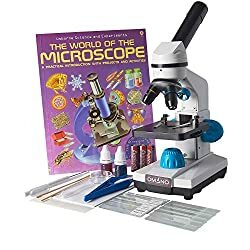 A solid handheld microscope make it easier to move anywhere you want to improve the communication between your kids and his classmates. The all new Apex Explorer stereomicroscope. This is an upgraded version of one of our most popular models, with LED illumination. 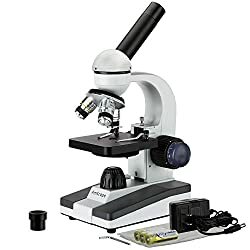 The Explorer comes with two pairs of eyepieces (x10 and x20) and two objectives (x2 and x4). 3D stereomicroscopes are ideal for examining the world around us without the need to make microscope slides. Magnification options x20, x40 and x80 with both incident and transmitted rheostat controlled illumination. Normally £78 – £26 off for a limited time! Objectives x4, x10, and x40 with eyepieces x10 and x20 giving a magnification range of x40 to x800. Free starters pack of plain slides, coverslips and already prepared slides. Attache type carrying case available as an accessory. We have introduced a much improved model to replace our Learner brand (from 1/11/2011). The all new Learner can be used to look at both slides upto x800 and whole objects upto x200. A magnification range much higher than other rebranded versions. 【High Resolution Quality Image】10X to 200X Magnification Ratio, 2.0 Megapixel CMOS Sensor with a 10mm to 500mm Focus Range, captures and saves high-resolution images and videos. 1280 * 720, 1600 * 1200 resolution (maximum photo resolution: 1600 * 1200, video maximum resolution: 1280 * 720) allowing you see the objects in vivid details. 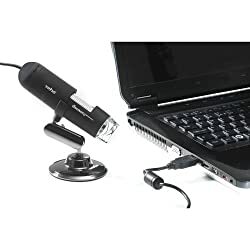 【Newest 3 in 1 USB digital microscope camera, USB, Micro USB, Type-C】Featuring with Type-c connector and compatible with Windows XP/7/8/10 & Macbook OS computer or OTG Android device & UVC compatible Android 4.4+ system smartphone, like Samsung S3, S4, S5 etc(Not support iPhone). 【IP67 Waterproof, 8 Brightness Adjustable LED lights, 8.0MM Diameter Camera】The digital microscope is made of 8.0mm HD lens, 8 Brightness adjustable LED lights, IP67 waterproof camera, allows you to inspect areas under water, gaps, holes and observe any hard-to-reach or hard-to-see area. That’s significantly helpful. WF10X wide angle optical glass lens, using coated optical accessories; can switch to 4X 10X 40X anytime,Convenience children comfortable observation, large field of vision, clear and sharp image. Rotate the 5-hole filter disc to get a comfortable vision when the image is too bright;With up and down LED light source, high brightness, long life, can be charged, you can also use AA batteries. Beautiful appearance, light structure, very suitable for kids, high school students to observe biological slices and making specimens. 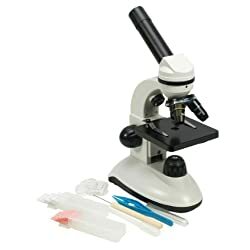 Also can be used by health testing companies to do biology, pathology examination and analysis. WF10X all-optic glass wide-angle ocular, combined with lens unit of 4X, 10X and 40X, gives you for kids large view and comfortable experience of watching. Three metal achromatic lenses use the cementing of lenses of two different refractions to form sharper imaging. Both 45° inclined ocular tube and 360° rotatable tube head make any angle possible to view conveniently. Metal body with white enamel finish makes it solid, elegant and also long lasting. 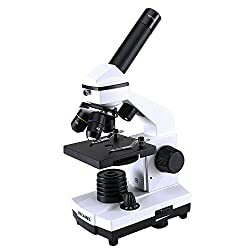 The revolving nosepiece turns it into the ideal microscope for students from primary school to high junior school for children or in family to study science since it has the precise focusing that is necessary for scientific research and cultivation test. 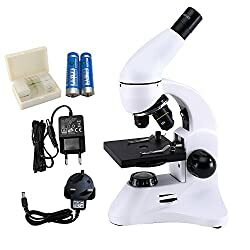 Pandaoo Wifi Handheld microscope is a useful and funny magnification for kids, children, students, engineers and others who need to magnify and explore the micro things like circuit board, coin, jewelry, skin and insect. 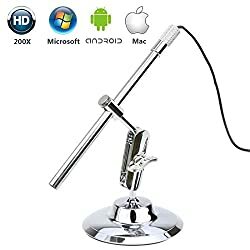 Be compatible with IOS iPhone, iPad, Android Phone and table, MacOS, Window XP 7 8 10, Linux, Chrome OS. 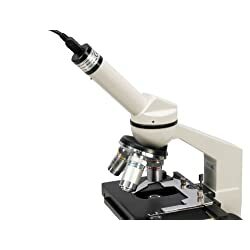 Built-in 8pcs LED lights, digital microscope’s 2 adjusting knob can change the focus and brightness. 1000X 2MP HD Inspection Camera Mircoscope: 50X to 1000X amplification, applicable to multiple research program.